Jünemann employed Trompe L’oeil, an art technique that employs extremely realistic imagery to create a three dimensional perception, by way of an optical illusion. Note the illusion of stairs leading up to an imaginary art gallery displaying Emily Carr’s framed paintings. These paintings depict examples of the forested landscapes of BC she so deeply cherished. Left to right, the paintings are Sombreness Sunlit, Mountain Forest, Loggers Culls, Happiness and Red Cedar. They were painted on Evolon, a non-woven acrylic microfiber, in Germany, and applied on site; a first for Chemainus and Canada for this type of process. 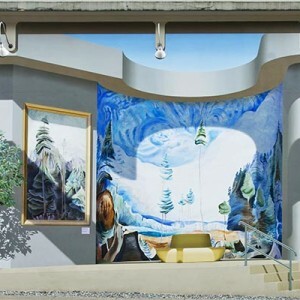 Jünemann spent more than 2000 hours painting the Trompe L’oeil mural. He used more than 2.5 kilometres (1.55 mi) of blue tape to mask for shadows and special effects. Every leaf on the Arbutus tree is different; no two leaves are alike.